This weekend I went hiking in New Hampshire’s White Mountains, which proudly boast the worst weather in America. Even though we lucked out with a gorgeous day, it was still a grueling hike. We managed to hit three of the Whites’ tallest peaks (Madison, Adams, and Jefferson), covering 14 miles of rocky terrain with about 6,000 feet of elevation gain. Upon reaching the first summit, I perched on top of the world like a god, and gazed down at the White Mountain National Forest, spread out below me in a breathtaking panorama of natural beauty. As I sat there upon my mighty throne of granite, I thought to myself, “Jesus Christ, this was a lot of work. Why did I want to do this, again? ?” Then I tried to refrain from coughing up one of my lungs. Catching my breath, I tried to remember what I could possibly have been thinking when I left the house at 5:00 AM that morning. 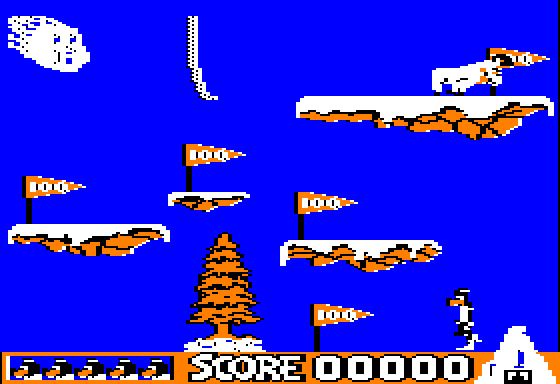 Then it occurred to me that as a form of recreation, mountaineering and video games actually had a lot in common. Perhaps it was these commonalities that appealed to me. I’ve actually hiked the White Mountains in the winter, though only after undergoing extensive training using the sophisticated simulation tool shown above. For example, both video games and mountain climbing deal in well-established and clearly articulated goals. In world where success and accomplishment are typically about as firmly defined as my sagging pecs, it’s nice sometimes to know exactly what it is you’re supposed to be doing, regardless of whether it’s “kill that bad guy” or “walk from here to that high-up place over there”. Second, like video games, climbing a mountain yields reliable, tangible rewards for your efforts. When playing a video game, you know that if you do everything it asks of you, eventually you’ll “beat the game”. Likewise, when hiking you know that if you keep going up, eventually you’ll reach the highest point. Just keep on putting one foot in front of the other, and eventually you’ll be able to look down on those puny trees with the same ruthless disdain that a level-30 Dragon Warrior reserves for the average Slime. Finally, and perhaps most importantly, video games and mountain climbing both understand the importance of engaging the user with visual stimulation. The capabilities of current-generation gaming systems have gotten pretty amazing, and keep getting better all the time. However, while hiking we also saw some pretty nice views… and I have to say that for an old analog system, the graphics were still pretty good.